Anxiety and depression are two of the most common mental health concerns in our society. The key to successfully treating depression and anxiety is to identify the root causes and the the hidden triggers. This includes the state of your physical health, how you manage stress, your relationships, nutrient deficiencies, underlying infections, toxic load, a health timeline, your environment, food and chemical sensitivities, underlying sources of inflammation, medications, substance abuse, digestive health, and mental, emotional and spiritual stressors. Research suggests that inflammation is linked to depression. 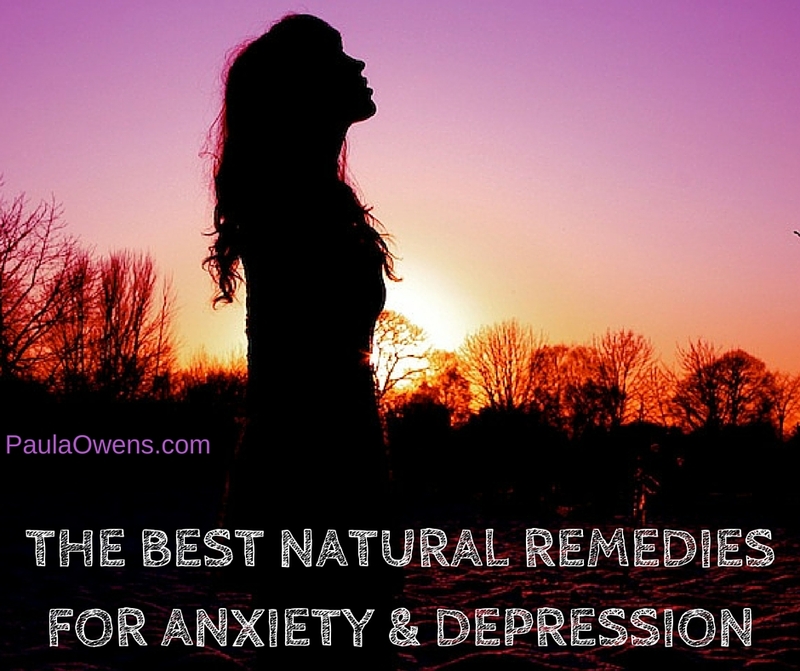 The information in this article provides you with valuable information, natural healing therapies and some of the best natural remedies for depression, anxiety and mood disorders. The World Health Organization reports that depression is the leading cause of disability affecting more than 120 million people worldwide. According to the National Institute of Mental Health, nearly 15 million American adults suffer from major depression, and 40 million more have anxiety disorders. Prescriptions for antidepressants rose by a staggering 1300% in a ten year period from 1990 to 2000! In 2010, antidepressants were the second most commonly prescribed type of medication in the U.S. with over $12 billion spent on antidepressants. An astounding one in four American women and one in seven men take prescription drugs for stress, insomnia, anxiety and depression. 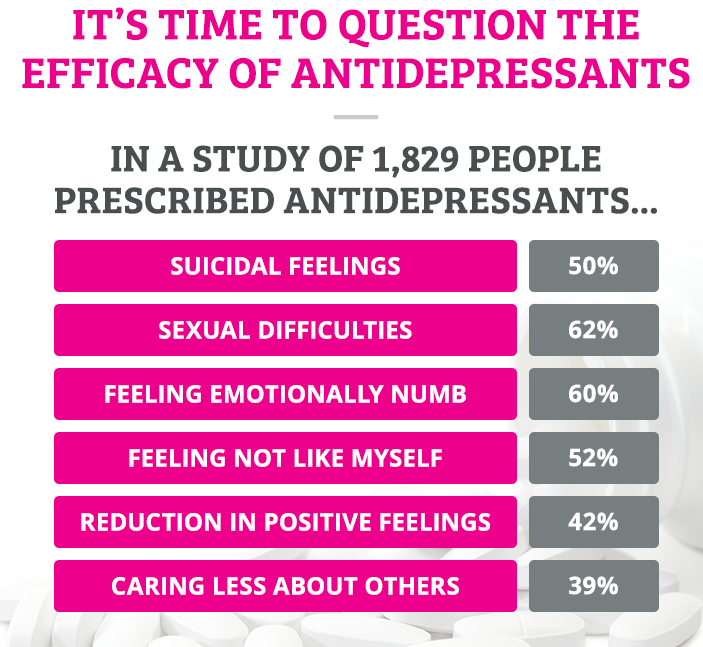 Women are three times more likely to use antidepressants than men. Twenty-five percent of women age 40-50 and approximately 5% of children and teens ages 12-19 take antidepressants. The use of antidepressants in children and teens ages 6-18 has dramatically increased in the past decade. Most patented antidepressants “work” by boosting the levels of mood-regulating neurotransmitters in the brain. Although the FDA and other licensing authorizes have approved SSRIs and other antidepressants for the treatment of depression, there are serious doubts about their clinical efficacy. Meta-analyses of antidepressant drugs published in PLoS Medicine have reported only modest benefits over placebo treatment. A study published in the Journal of Clinical Psychiatry revealed that antidepressant drugs work no better than talk therapy or placebo pills at relieving depression. In yet another study with 2,500 subjects, researchers at the Yale University School of medicine found that 20% of those taking drugs for depression actually do worse than people who were given a placebo not containing any drug. No one is drug deficient! Antidepressants, OTC and prescription drugs for mood disorders, insomnia and anxiety do NOT address the root cause. These drugs are just band-aids with serious and harmful side effect! And ladies, if you’re pregnant or planning to become pregnant, be informed that antidepressant drugs are especially dangerous to a developing fetus. According to a study published in the journal Pediatrics, SSRIs used during pregnancy are linked to autism and developmental delays. About 4,000 families in the U.S. have children born with major birth defects each year because of antidepressants taken during pregnancy. Up to 20,000 women per year miscarry as a result of these toxic drugs. Research suggests that depression may be primarily caused by inflammation. A large body of research suggests that depression is associated with a low-grade, chronic inflammatory response and is accompanied by increased oxidative stress. Inflammation is at the root of nearly all modern disease, including diabetes, Alzheimer’s, cardiovascular disease, autoimmune disease, allergies, asthma, and arthritis. Unfortunately, the importance of the factors listed below are frequently (and sadly) ignored when it comes to anxiety, depression, mental health and emotional disorders. high copper levels. It’s estimated that nearly 70% of children with ADHD have elevated copper. Those that suffer from postpartum depression tend to have high copper levels. Depression, Anxiety and Mood Disorders: Did you know . . .
• The shift away from traditional lifestyles are linked to increased rates of depression and other mental health disorders. • Nutritionally-void diets that are high in sugar, processed foods, gluten and grains are linked to an increased risk of developing depression. • Men who are depressed are more likely than women to mask symptoms with alcohol. • Unhealthy bacteria and imbalances in the microbiota (gut flora) greatly influence mood and can lead to anxiety and an increased risk of depression. • Inflammation drives depression to serotonin depletion. The higher the levels of inflammation, the greater the risk of developing depression. Depression has also been linked to an increased inflammatory marker in the blood, C-reactive protein (CRP). Psychiatric researchers have observed that patients with higher levels of inflammatory markers are less likely to respond to antidepressants, and more likely to respond to anti-inflammatories. • Low levels of folate are linked to depression in the elderly. A study in the British Journal of Clinical Pharmacology found that nursing home residents taking SSRIs increased their risk of falling by 300 percent. • The majority of serotonin is made in the gut, not the brain. Hence, the importance of healing the gut first! The second brain is through the gut, known as the gut-brain axis. Anything that affects the gut, affects the brain. An inflamed gut is an inflamed, irritable brain. A leaky gut is a leaky brain! An inflamed gut = an inflamed brain increasing risk of depression and dementia. • Low testosterone and free T3, an important thyroid hormone are associated with depression. • Toxins in the environment and chemicals our food supply (pesticides, GMOs, toxic heavy metals, lead, mercury, xenoestrogens, glyphosate) interfere with neurotransmitters. • Studies show that there’s an increased risk of depressive symptoms in healthy adults with blood chemistry indicative of blood sugar imbalances, insulin resistance, hypoglycemia and diabetes. • There is a connection between depression, anxiety with both diabetes and alcoholism. • Medication induced depression. Statin drug use is linked to depression and diabetes. Other medications such as blood pressure medications, heart medications and arthritis drugs are also linked to depression. • Very low cholesterol, <150 is associated with a significantly increased risk of developing depression. • Bipolar symptoms can be related to Lyme disease and also toxic mold (mycotoxicity). • There is an inverse relationship between nutrient deficiencies and depression particularly vitamin D, omega-3 fatty acids, B vitamins (folate, B12, vitamin B6 and thiamine), zinc and magnesium. • Poorly planned vegetarian and vegan diets can induce depression. Women who do not consume red meat are twice as likely to experience anxiety or depression disorders. • What happened in early childhood, in utero and sometimes even before conception through epigenetics influence your innate biochemistry and can increase susceptibility to depression. • Methylation is crucial for neurotransmitter production. Serotonin, dopamine, epinephrine and norepinephrine all depend on methylation. • High copper levels are important to rule out in those suffering from postpartum depression, behavioral and attention disorders, OCD and ADHD. • Stress, poor diet, neurotoxins, genetic predisposition, drugs (Rx, OTC & recreational), infections, alcohol, marijuana and caffeine can cause inflammation and neurotransmitter imbalances. Fix the gut. Over 2/3 of neurotransmitters are made in the gut. The majority of serotonin, 90-95%, is made in the gut not the brain. If your gut is inflamed, infected or not functioning optimally, production of neurotransmitters will be impaired resulting in depression. The intestinal barrier may be compromised in depression, which causes leaky gut and many other digestive ailments. Psychological stress and exhaustive exercise have been shown to increase gut permeability. The gut has a profound impact on the brain. Taking care of your gut is taking care of your brain. Digestive and elimination problems inhibit absorption of nutrients thereby causing nutrient deficiencies, hormone imbalances, mood disorders and brain dysfunction. The second brain is through the gut (gut-brain axis). The gut has more neurons and produces more neurotransmitters than the brain. Your brain is connected to your gut and vice versa. An inflamed gut is an inflamed brain just as a leaky gut is a leaky brain. An inflamed, leaky brain increases risk of depression, bipolar, mood disorders and dementia. Intestinal microbiota are important in normal healthy brain function and have a powerful influence on the brain. The gut-brain involves intestinal microbiota. The delicate balance of your gut ecosystem determines how you look, think and function. The flora in your gut helps maintain brain function and influences risk of psychiatric and neurological disorders including anxiety, depression, bipolar, dementia, autism, Parkinson’s and Alzheimer’s. Use food as medicine. Processed foods, sugar and carbs rob the brain of necessary nutrients because of rapid blood sugar fluctuations resulting in blood sugar imbalances, insulin spikes, inflammation, and higher cortisol secretion, which intensify existing problems. Stabilizing blood sugar is especially important in preventing episodes of anxiety, depression, behavioral and mood problems. A study in the Journal of the American Academy of Child & Adolescent Psychiatry has shown that unhealthy maternal and early postnatal dietary patterns (sugar, processed carbs, fast foods, high-sugar beverages, high-sodium snacks) elevate the risk of behavioral and emotional problems in children. Eat 12-15 servings of organic leafy greens daily! Dark green vegetables and leafy greens are one of the highest sources of folate, which is a crucial nutrient for depression and anxiety. Identify food sensitivities, which increase inflammation and compromise brain function. Eliminate offending inflammatory foods that negatively impact mood, the brain and the gut. The common culprits include sugar, gluten, wheat and processed grains, GMOs, pesticides, pasteurized dairy products, casein, corn, soda, HFCS, artificial sweeteners, colors and dyes, soy, vegetable oils and processed foods. Consume an anti-inflammatory, nutrient-rich, real food diet. Avoid low calorie diets, low-fat diets, sugar, fructose, grains, processed carbs and processed that are directly linked to depression due to the depletion of vitamins, minerals, nutrients and amino acids caused by consuming these items. Polyphenols and other phytochemicals found in turmeric, cocoa, green tea, coffee, blueberries, pomegranate, saffron and raw honey have been been documented to provide anti-depressive properties. Sip on a cup of green tea or cocoa: blend raw cacao, water, grass-fed butter, coconut oil and stevia in a Vitamix or high-powered blender. Dark chocolate with a cocoa content of at least 70% stimulates the production of endorphins (the “feel-good” hormones) and releases serotonin. Coffee is linked to a lower risk of clinical depression, particularly in women as long as one is able to metabolize it. In a ten-year study of over 50,000 women, the results showed a negative correlation between suicide rates and drinking coffee! It was suggested that caffeine blocks the effects of unhappy hormones on our brain and reduces feelings of depression. This applies to organic coffee only! Are you drinking enough water? The regulation of water balance and electrolytes is essential for the maintenance of mental and physical health, and healthy brain function. Excessive alcohol or marijuana use is linked with a higher risk of depression. Men in particular often resort to alcohol when depressed. Tame the flame. The role of oxidative stress and inflammation are emerging as a viscous cycle that directly influences the brain and alters mood. The combination of the two appear to be both a root cause and a consequence of depression. One must determine the root cause of the inflammation, which stems from many sources. In addition to diet, other sources of hidden inflammation include gut issues (leaky gut, dysbiosis, H. pylori, SIBO), mycotoxins, heavy metal toxicity, chronic infections (viral, bacterial, fungal, dental, Candida overgrowth), low vitamin D levels, periodontal disease, essential fatty acid deficiency and other nutrient deficiencies, obstructive sleep apnea, chemicals in our food, water and the environment, dehydration, and mental, spiritual and emotional stress. Nutrient deficiencies. Balance body chemistry with Nutrition via a Functional Blood Chemistry Analysis. Evaluate your metabolic status to identify your unique nutrient deficiencies or excesses that have a direct impact on mood. Common nutrient deficiencies in those with anxiety and depression include folate, vitamin B12, vitamin B6, zinc, magnesium, vitamin D, essential fatty acids and protein. It’s risky to self-treat without assessing for biochemical individual imbalances. “Omega-3s reduce symptoms of depression by 50%!” Joseph Hibbeln, M.D. Test to Assess. In addition to thorough blood work, organic acid test, micronutrient testing, toxic metal test, thyroid and hormone testing, and a PCR stool test, those with with mood disorders, anxiety, ADD, ADHD, OCD, depression, bi-polar, schizophrenia, PANDAS and alcoholism should all be screened for pyroluria and mycotoxicity. Genetic testing can provide valuable insight and information that can be helpful for treatment. OTC and prescription drugs such as antibiotics, sleep medications, hypertension medications, acetaminophen (Tylenol) and NSAIDs adversely affect the brain and gut. Antidepressants, anti-anxiety and insomnia medications alter brain plasticity. A study published in the British Medical Journal found that people who take prescription sleeping pills regularly are nearly five times more likely to die within 2.5 years and have four times a higher rate of cognitive dysfunction and dementia compared to those who do not take the drugs. Addiction to sleep aids is often an indication of depression. Sleep. There’s a link between sleep deprivation, sleep apnea and other sleep disorders with depression. Those who sleep less than or more than 7-9 hours a night have an increased risk for depressive symptoms. The key to successful treatment of depression is prioritizing restful, uninterrupted sleep and addressing insomnia. Move your body! Scientists at UT Southwestern Medical Center found that moderate and intense daily exercise works just as well as antidepressant drugs. For women who had a family history of mental illness, moderate exercise worked best. For those who had no family history, intense exercise was more effective. More intense exercise was most beneficial for men in general. While aerobic exercise will temporarily increase feedback to the brain, anaerobic weight training produces a more permanent affect. Healthy adrenal function. The health of the adrenals directly influence our physiological and emotional well-being. Adrenal insufficiency is the most common hormonal imbalance in women. Healthy functioning adrenals are sadly overlooked when it comes to depression, anxiety, hormone imbalances, thyroid disorders, menopause problems and optimal health. Vitamin N (Nature) is a super effective antidote to naturally optimize cortisol levels, reduce oxidative stress, lower anxiety & stress hormones, raise serotonin, improve sleep quality, increase vitamin D, avoid noise pollution, lower inflammation and a time to connect with God. Studies show exercising in nature has a positive impact on mood as compared to exercising indoors, and is associated with greater feelings of restoration, increased energy, and decreased tension, confusion, anger and depression. Sounds from nature reduce stress hormones, facilitate recovery from psychological stress and activate DNA segments responsible for healing and repairing the body better than noise from urban environments. Are you suffering from “Nature Deficit Disorder” (NDD)? Take a break from artificial lighting, stressful, noisy environments, iPads, smart phones and the television, and experience the peace, beauty and natural healing power of nature. Mind-body techniques such as yoga, Qi gong, Tai Chi, prayer, meditation, mindfulness breathing, diaphragmatic belly breathing, and a connection with God, a Higher Power, Source or any type of spiritual practice can switch on and off certain genes linked to stress and have proven effective for anxiety and depression. A study in Psycho-Oncology showed a 50% reduction in depression and a 12% increase in feelings of peace after practicing restorative, yin or gentle yoga. Meditation. Meditate don’t medicate. According to a study published in the journal BMJ Open, the more meditation participants engage in, the greater the improvement in their mental health. Participants reported a 58% reduction in anxiety, a 57% reduction in depression and a 40% in stress. The key is consistent daily practice. Amino acid therapy. Amino acid imbalances are linked to everything from depression to anxiety to fibromyalgia. Most depressed and anxious individuals have low levels of amino acids. Amino acids work well as neurotransmitter precursors and agonists. Fulfilling relationships, occupation, and personal life. Soul wounds. Unresolved trauma, adverse childhood events (ACEs) unforgiveness, repressed anger, prior abuse, emotional wounds, feelings of isolation, loneliness, being stuck, and the loss of a dream can all be very painful. Soul pain is real. It’s more than the serotonin. Gratitude attitude. Those that express gratitude through jotting down things, people or experiences they’re grateful for in a gratitude journal are happier, more optimistic and tend to exercise more. Manage stress and your perception to stress. Practice some form of de-stressing activity every day. Chronic stress and depression are associated with accelerated aging. Alternative therapies and bodywork. Craniosacral therapy, transcranial stimulation, chiropractic care, massage, EFT, osteopathic manipulative therapy, neurofeedback, aromatherapy with essential oils, EMDR, light therapy, and acupuncture are all helpful therapies for anxiety, stress, depression and mood disorders. Keep a journal. Expressive writing is especially helpful for those who have experienced a traumatic event. Spend anywhere from 2-10 minutes a few times per week writing your thoughts and feelings. Expressing your story through writing in a diary increases happiness, encourages a solution, and boosts psychological and physical well-being. Mindset. Consider how your choices, your thoughts and circumstances may be affecting your outlook on life. Look at your environment, sleep patterns, what you eat, how you spend your time and with whom you spend it. Be kind to yourself. Love and nurture yourself. Take some time to determine what feels and works best for you. Always fuel your body with nutrient-rich real food. Nourish yourself with plenty of vitamin L (love), kindness and compassion. Practice the “I AM A-Z Exercise” every single day. Identify and correct nutrient deficiencies. This is essential for proper brain function and mood regulation. It’s important to identify your personal nutrient deficiencies, which will be different for each person and their biochemistry. As with any form of treatment, nutritional therapy should be supervised and doses should be adjusted as necessary to achieve optimal results. *** If you’ve noticed depressive symptoms consistently for over a month, please see a medical professional (a trained psychiatrist, psychologist or social worker). Suicidal thoughts or attempts and obsessing about death are serious warning signs that need to be addressed immediately. *** Never stop any medication without the guidance and direction from the prescribing physician. *** The information in this article is offered for informational and educational purposes only. There is no replacement for professional medical treatment and advice, and you are urged to consult with your functional health practitioner before pursuing any treatment or supplement regime. Are Your Symptoms Related to Food Sensitivities?